I have a confession to make, readers: I’m a Disney addict. I blog about it, plan it, am known as the “Disney lady” by everyone at work and in my personal social network. I average three emails a week from friends and acquaintances requesting my advice on Disney vacation planning. Looking back over some of those emails recently, I compiled the following Frequently Asked Questions (FAQs) most often posed to yours truly by folks who are planning their first trip to Walt Disney World Resort in Florida. 1. Do I really need to “plan” what is supposed to be my “down time”? In a word, yes. Why? Disney is not a place where you can simply show up and expect to have a good time. It’s an expensive undertaking for most people that involves hotels, food, park tickets, souvenirs, etc., and nobody should fall victim to a bad Disney vacation. A few hours spent with a good guide book (I like the Unofficial Guides) and the services of a Disney travel professional are critical to ensuring that you and everyone in your travel party gets the most out of your Disney vacation. 2. Why is Disney so expensive? And this holds true for Disney. There are lots of cost-cutting measures, tips and tricks – to read more check out MouseSavers.com that people employ. I always tell people to set a budget for their trip and stick with it. Disney is expensive because it is, simply put, the best. From the first Cast Member you encounter to the last, every single person in your path is there to provide the most extraordinary customer service you will ever experience. Once you’re on the property, you’ll make ‘free’ memories that last a lifetime. One of top tips for saving money is to get some snacks for your room by ordering from a delivery service (Personal Disney Shopper or Garden Grocer). Some moms I know also like to order from diapers.com and have items shipped to their hotel rooms so that they don’t have to pack food, water, snacks, diapers or wipes in their luggage. If you can’t afford Disney, consider saving up for an extra year (or two) so that your first experience can be all that you want it to be. 3. Do I need to rent a car? I’ve never rented a car when going to Disney as my husband and I prefer to take advantage of Disney’s Magical Express bus service. However, if you’re staying at a Value resort farther from the parks or even off-property, you might want to consider a rental car to speed your travel. Be sure to factor this into your overall vacation budget, keeping in mind that there are costs to park at each Disney area except Downtown Disney. 4. What’s the best resort for my family? Only you really know the answer to that. It will depend a lot on the budget that you’ve set for your vacation if a value, moderate or deluxe hotel is in your plans or if you’ll stay off-property. Some people opt to rent Disney Vacation Club points from owners who cannot use them (note: I’ve done this and was able to get a studio room at the Boardwalk for the same price as a moderate resort [Port Orleans French Quarter]). You can read recent reviews of all Disney properties here or check out what folks are saying on TripAdvisor.com. 5. What type of park tickets do I need and for how many days? This will come back to your budget and your family’s vacation style. 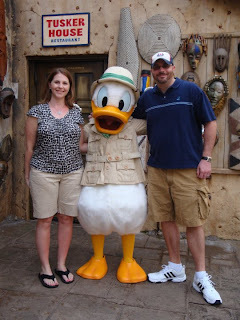 For many years, my husband and I had park hoppers for every day of our trip (except our departure day). Now we’re a little bit more laid back and if we’re on property for 9 days, we’ll get 7 or 8 day park hoppers. For families travelling with small children, I recommend base tickets – these allow you to access the same park in one day as many times as you want. You can read more here about the different types of Disney park tickets here. 6. Is the meal plan right for me? The cost per adult is $55.59 per night or $778.26+ tax and the cost for the child is $17.16 per night or $120.12+ tax. In short, is your family going to eat $1,000 +taxes and gratuities worth of food? There’s a great breakdown of meal costs at WDWInfo – definitely worth checking out. 7. Do I need a travel agent? I recommend that you use a travel agent. Sure, you can go through all of the worry and hassle of booking your trip and all of your dining reservations yourself, but why should you? A reputable, certified Disney Vacation Planner is your best ally in putting together a memorable and stress-free Disney trip. Feel free to contact me for my agent’s contact info. Nice Blog..thanks for share this great knowledge! Date Night - Magic Kingdom Style!